Omemee Pigeon eFlyer: Josie Sibley Lovingly Remembered - Funeral December 27! Omemee news,events,and views from Greater Omemee Area, Ontario, Canada. Covering rural news between Peterborough and Lindsay. Submit your news! Josie Sibley Lovingly Remembered - Funeral December 27! Longtime Omemee Resident Josie Sibley Celebrated! SIBLEY, Josephine 'Josie' (nee Mitchell) - Passed away peacefully on Tuesday, December 23, 2014 at Victoria Manor at the age of 87. Josie had a strong faith and was looking forward to going home to be with the Lord. Josie, beloved wife of the late Kenneth (1974). Devoted mother of Robert (Marion), Roy (Linda), Barbara Northey, Nancy Watts, Mary Cooper (Garry), May Baptie (Dennis), June Swaffield, Bonnie Rose (Barry), Daniel (Alison), Kenneth (Mariette) and Kerby (1995). Josie will be lovingly remembered by her numerous grandchildren, great-grandchildren and great-great grandchildren. She will be missed by her siblings Donald Mitchell and Thelma Reid, as well as many extended family members and friends. Viewing will be held at Omemee Baptist Church, 21 Sturgeon N, Omemee, on Saturday at 10:00 am followed by a funeral service at 11:00 a.m. and reception to follow at the church. In lieu of flowers donations in Josie's memory may be made to the Lakeshore Pentecostal Camp, or the Omemee Baptist Church. What do you remember about Josie Sibley? Any adfly links below will open with a word from a sponsor to help cover expenses. Click the "Skip Ad" Button when it appears in the top right corner to proceed to the webpage. Find out more at : http://adf.ly/?id=4009826 Want a direct link to your site? Leave a confidential comment to sponsor a post. Those who post comments are accountable for the opinions they express, and the accuracy of the information they furnish. While we encourage writers to utilize this service on our site, we also strongly suggest they treat it as public forum where good taste counts. We reserve the right to decline for approval objectionable material from this site. Writers that include profanity or personal attacks or other inappropriate comments - such as racist language, threats or comments unrelated to the story - will not be approved. Also, entries that are unsigned or signatures by someone other than the actual writer will not be approved. While writers can still post anonymously, we strongly suggest that they do not do so. 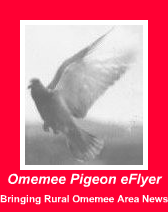 Opinions, guidance and other information expressed in Omemee Pigeon eFlyer comments and by contributors to the Omemee Pigeon eFlyer, represent the individuals'; own views and are not necessarily those of the Omemee Pigeon eFlyer. The Omemee Pigeon eFlyer furnishes this type of forum and does not endorse and is not accountable for statements or advice from anyone other than an designated Omemee Pigeon eFlyer spokesperson. (Frequently Asked Questions) Choose your favourite and send a letter to the editor. 1. Why isn't this paper being run on a "dot com"? 2. Who is running this paper? 3. Why do you have Google ads on here? 4. Where can I get a print copy of this paper? 5. How can I help make this paper even better? 6.I'd like to buy you a coffee.Where can I send a donation? Thanks! Every bit helps! Who Reads Omemee Pigeon eFlyer? You do! Most readers are from our direct area,but people the world over do read Omemee Pigeon eFlyer. We currently have over 2,000 accounts getting our headlines,and almost 100 daily email subscribers. Not bad for a little eZine just starting out. We are especially excited about the writers joining in this project! Help Keep Omemee Pigeon eFlyer Flying! - Add an event!- - Post a Free Ad!! - - Write an Article! Omemee Residents Fenelon Falls Bound New Years Day! All Aboard! Omemee Ontario Area Residents Hopping Buses! Fab Omemee Pigeon eFlyer Friends Help Lost Dog! Hey Omemee! Billy is Lost! Have You Seen Billy? UPDATE: Bill Denby Fake Threatens Lawsuit! Top Badminton Player Sermon Title- Girls! Weather Forecast - Omemee November 3-12 - Adjust Your Driving! Join Our Favourite Fans! Follow Us! In Canada, everything is Copyright as soon as it is written. Contact http://scr.im/omemee. Powered by Blogger.